Originally published under the title "The Politics of Radicalization." Towards the end of his too-brief life, George Orwell came to the conclusion that English society had become decadent and that "the English language is in a bad way." It was 1946, several years before introducing the world to "newspeak" with his greatest novel, 1984, when he wrote perhaps his greatest essay, "Politics and the English Language," describing the disease he observed and prescribing its cure. The belief that "political chaos is connected with the decay of language" led him to conclude that language had become "ugly and inaccurate because our thoughts are foolish [and] the slovenliness of our language makes it easier for us to have foolish thoughts." Today, the ways we speak and write about the threat of Islamism are often inaccurate and slovenly, making "foolish thoughts" almost inevitable. Everyone involved needs Orwell's prescription. The post-9/11 era is rife with what Orwell called "the abuse of language" ("war on terror," "overseas contingency operations"), but no abuse more obviously illustrates his complaints than the media cliché describing how a moderate Muslim becomes an Islamist: he becomes radicalized. This euphemism (a passive construction in grammatical terminology) denotes almost nothing. Orwell calls it a "verbal false limb," that is, a device used to "save the trouble of picking out appropriate verbs and nouns." It has become the default explanation for a phenomenon few want to discuss. "Politics and the English Language" has advice for arresting the English language's slide into decadence, culminating in 6 rules that "will cover most cases." Each rule points to its author's zeal for clear and precise prose, unmarred by clichés, jargon and anything extraneous. Among the obstacles to clarity, the passive construction is so severe that rule #4 is "Never use the passive where you can use the active." An active structure emphasizes the agent of activity conveyed in the verb: "Tom kicked the ball." A passive structure emphasizes the object being acted upon: "The ball was kicked by Tom." It can also eliminate the agent altogether: "The ball was kicked." Aside from being imprecise, passive constructions allow writers to conceal important evidence: who kicked the ball? Or, more germane to political prose: who dropped the bomb? Who gave the order? Who planned the attack? There is much to dislike about both the passive "was radicalized" construction and the term "radicalization," which comes from an adjective (radical) turned into a verb (radicalize) and then into a noun. The term "self-radicalized," which appears to be a reflexive passive verb, if such a thing exists, is even worse. The passive construction in each blurs the relationship between agent (Tsarnaev, Farook, Nidal) and the already-vague verb "radicalized." Each deflects responsibility elsewhere, or omits it altogether, treating "radicalism" as a contagion that infects its host upon first contact. What Gore Vidal called "the popular Fu Manchu theory that a single whiff of opium will enslave the mind" is not a good metaphor for Islamism. Islamism is inculcated over time. Teachers spread it in schools with books. Imams and community leaders reinforce it in mosques and Islamic centers. Some communities ignore it, and some families tolerate it. Sudden Jihad Syndrome only appears sudden to outsiders. What Gore Vidal called 'the popular Fu Manchu theory that a single whiff of opium will enslave the mind' isn't a good metaphor for Islamism. 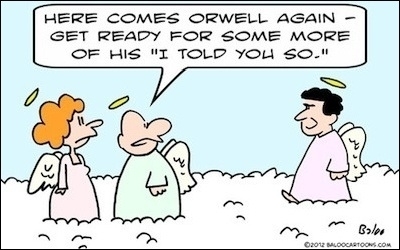 Orwell insisted that language always be used "as an instrument for expressing and not for concealing or preventing thought," but he understood that not everyone shared his view. The "was radicalized" construction has become ubiquitous mostly by thoughtless repetition, but to those who deliberately obfuscate, this seemingly inoffensive passive construction provides a way to avoid what has increasingly become the un-nameable. Maajid Nawaz calls this "the Voldemort effect: the refusal to call Islamism by its proper name." Those who make and influence US counterterrorism policy must recognize that jihadists are not created accidentally or spontaneously. Speaking and writing as though they are, either deliberately or through "the slovenliness of our language," hinders clear thinking. And as Orwell put it, "to think clearly is a necessary first step toward political regeneration: so that the fight against bad English is not frivolous and is not the exclusive concern of professional writers."